The region’s dignitaries who attended the Civic Day at the Humber Bridge on Saturday, in front of the north tower. DIGNITARIES and Civic Leaders gathered at the Humber Bridge on Saturday to celebrate the iconic structure’s place at the heart of the local community. Mayors of Hull, Barton and North Lincolnshire; the Lord Lieutenant of East Yorkshire and Vice Lieutenant of Lincolnshire, and; representatives from the four local authorities and town councils near to the bridge, all took part in the Civic event which included a tour of the bridge and a trip up the north tower. 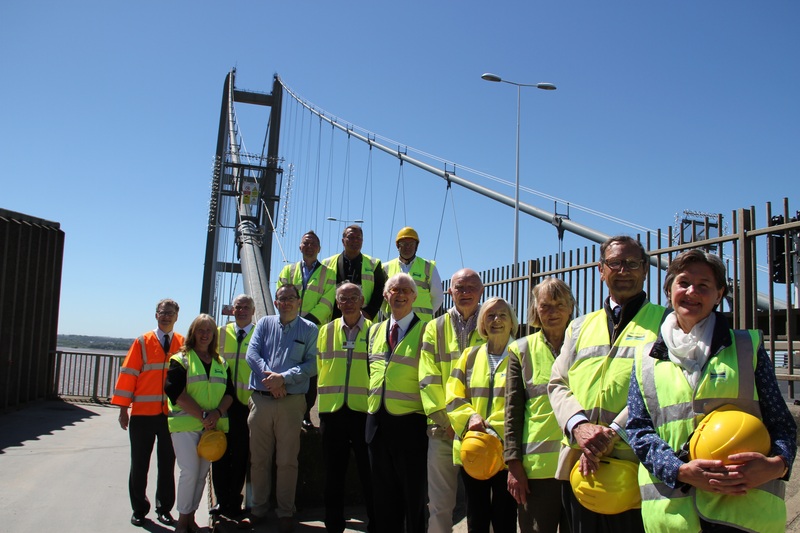 The visit was organised by the Humber Bridge Board to celebrate the close working relationship the Board has with its local stakeholders and the public. It was organised by Cllr Sean Chaytor, Labour councillor for Marfleet and Vice Chair of the Humber Bridge Board, who said it pointed the way to a more open future where the public will be able to tour the bridge, from the inner workings beneath the road surface to the tops of the towers. Cllr Chaytor said: “This is the first of a series of events which aim to demonstrate how much we appreciate the partnerships with have with our stakeholders in the region, and the public. It is about firmly cementing the bridge into the fabric of the local community. Cllr Chaytor added that events like this were a ‘warm up’ for the Humber Bridge’s 40th anniversary celebrations, which will take place throughout 2021. As well as touring the bridge, guests heard talks from the Hidden Histories team about how the Heritage Lottery-funded project was progressing, and took in the Soap Box Derby, which was also taking place on Saturday. They were greeted by Humber Bridge Chief Executive Dr Kevin Moore, who was part of the team that guided the dignitaries around the bridge. Dr Moore said: “It was a privilege to show our guests around the bridge to enable them to understand more about what we do here, but more importantly the value of the asset that we are entrusted to manage. For more information contact Nick Glaves at The PR Company on (01430) 478555, 07868 359016 or email nick@tprc.co.uk.